Immunoassay Sample Validation Experiments - What is Matrix Interference? 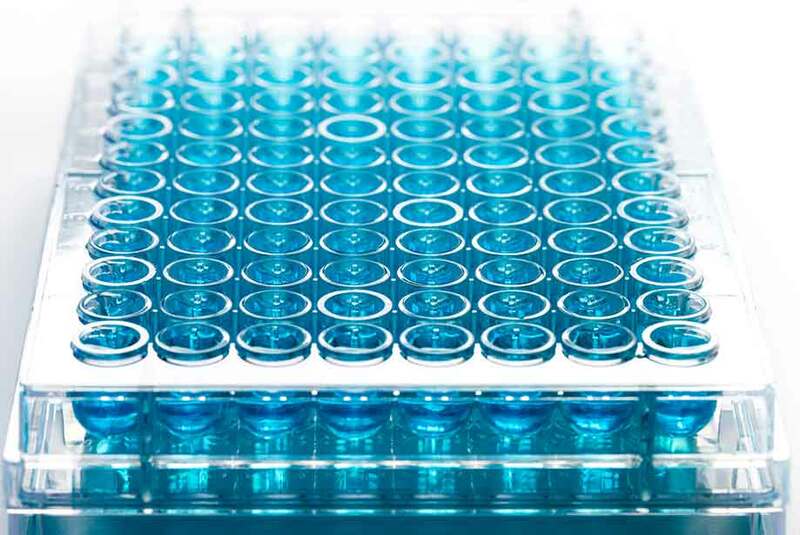 Enzyme-linked immunosorbent assay (ELISA) is a microplate-based technique frequently used for detecting and quantifying low-abundance analytes of interest in a variety of biological samples. The technique depends on two elements: (1) the highly specific antibody-antigen interactions measured via development of a colorimetric product generated by the interaction of an enzyme conjugated to a secondary detection antibody and a complementary colorimetric substrate and (2) accurate comparison of this same interaction relative to a recombinant protein that is used as a reference standard to generate a standard curve and interpolate the concentration of analyte present in a biological sample. In commercially available ELISA kits, a key component needed for accurate measurement of an analyte is performing sample validation for your unique samples and/or sample types not validated by the kit manufacturer. Samples need to demonstrate robust detection and quantification by a kit’s antibodies, which can initially be challenging due to differing antibody-analyte binding characteristics and differences in the endogenous substances present in the background amongst the analyte of interest that are inherent to sample matrices. This is otherwise known as sample matrix interference. These interfering substances are compounds with chemical differences but structural similarities that cross-react with the antibody targeting the analyte of interest. In this analytical interference, interfering endogenous substances or exogenous contaminants in your sample matrices can result in false increases or decreases to true analyte concentration levels reflected in optical density (OD). Some examples of protein-rich samples or samples with potential matrix interference are urine, cell lysates, and blood components such as serum and plasma. Aside from the endogenous substances inherent to the sample and exogenous contaminants produced through human error, an end-user may need to assess the compatibility of the assay diluent buffering solution in contributing to potential analytical interference. Interfering components can also be pH-dependent, detergent, organic solvent, and buffering salt composition and concentration which may dictate buffer compatibility. Exchanging the buffer may be necessary to resolve the interference in order to detect true analyte concentrations in your sample. On the other hand, when analyte levels are elevated significantly above the limit of quantification (LOQ) of the assay, optimizing the dilution of the sample becomes a strategy to overcome this interference. To ensure accurate detection and quantification in a sample and mitigate sample matrix effects, an end-user may need to consider sample validation via spike-and-recovery and linearity-of-dilution experiments. In spike-and-recovery experiments, the primary objective is to determine whether analyte detection is affected by a difference between the assay diluent/buffer used to prepare an end-user’s standard curve and the sample matrix. The sample matrix can be a neat (undiluted) biological sample or biological sample diluted in assay diluent. This is accomplished by adding a known amount of the recombinant protein standard (spike) into the natural test sample matrix and observing its response (recovery) relative to adding the same known amount to the assay diluent. The response (the resulting concentration) is interpolated from the standard curve and OD that resulted due to the addition of a known quantity of recombinant protein standard. After running the two sets of responses and calculating concentration from the standard curve, an end-user can calculate percent recovery to identify the percent deviation of the observed spiked sample value from the observed unspiked sample value relative to the actual known quantity to determine the compatibility of the assay diluent and sample matrix. An end-user wants to achieve an identical response for a given amount of analyte of interest in both sample matrix and assay diluent/buffer. In other words, fully compatible sample matrices should obtain a 100% recovery because the recovery observed for the spike is identical to the recovery obtained in both assay diluent and sample matrix. The % recovery may to deviate up to 20%. If the recovered value differs significantly from the amount expected (due to spiking with a known quantity) then this deviation from 100% recovery may suggest the degree of incompatibility/discrepancy of the assay diluent to the sample matrix in which case adjustments must be made to minimize the deviation. In cases of very poor sample recoveries, this adjustment may suggest using a different assay diluent whose composition more closely matches the final sample matrix. Samples that do not exhibit linear dilution at a range of dilutions indicates a matrix component is interfering with the accurate detection of the analyte of interest at a given dilution. As a result, correcting the dilution factor in a dilutional linearity experiment becomes necessary where the end-user will dilute the sample until the interference is no longer observed. Dilutional linearity experiments are performed to demonstrate that a sample with a spiked concentration above the upper limit of quantification can be diluted to a concentration within the working, standard curve range and still produce an accurate and reliable result. Poor linearity shown by the hook effect is mitigated by achieving dilutional linearity. The hook effect is seen as the concentration of analyte begins to exceed the amount of antibody. In this situation, the dose response curve plateaus and with further increase may start to become negatively sloped, demonstrating potential matrix interference and reducing the accuracy of quantifying the true concentration of analyte in a sample matrix as the concentration of analyte begins to exceed the amount of antibody available. The samples are tested by performing a series of factored dilutions within the analytical range of the assay using an approved, chosen assay diluent. When dilutional linearity is seen, the serial dilution scheme will be reflected roughly in OD change between dilution points in a linear trend or the sample will have roughly the same calculated concentration after applying the dilution factor to each dilution point. As an example, if the end-user conducts a two-fold serial dilution, there should roughly be a two-fold difference in OD between each point. With validated samples where the minimal required dilution (MRD) is known, this value can ideally be used to as a starting point and a range of dilutions can be determined to decide if the starting point is appropriate. If the sample has not been validated then a MRD may need to be identified through titrating a wider range of dilutions to achieve linearity. Once dilutional linearity is achieved, this confirms a high degree of accuracy and demonstrates the flexibility of the assay at varying dilutions. Performing a linearity of dilution experiment can also be done via preparation of several dilutions of a sample with low level concentration of analyte and then spiking the same known amount of analyte into each one before testing and assessing assay recovery by comparing the observed and expected values of non-spiked and/or undiluted samples. Samples detecting an ideal linearity should not demonstrate changes in observed analyte concentration relative to final analyte concentrations after factoring dilutions. Linearity is achievable for sample recoveries within a range of 80% to 120% of the expected values. Values that fall below two times the limit of quantification for the assay should be avoided in consideration of dilutional data due to statistical limits at the low end of the assay range. Enzo Life Sciences has an extensive catalog of ELISA kits geared towards detection of a wide variety of biomarkers with the option of testing multiple sample matrices from a diverse range of species. Our kits are highly published and Enzo Life Sciences has decades of experience developing and optimizing commercial immunoassays to meet the ever-changing needs of our scientific community. We provide a broad range of immunoassay kits for monitoring stress, reproductive physiology, health and welfare, and survival of wildlife animals. Our most popular ELISAs for the quantification of 17β-estradiol, progesterone, testosterone, cortisol, and corticosterone have been cited in numerous publications and protocols have been shared by zoos, aquariums, and conservation scientists worldwide. We are happy to provide simple yet useful tips and guidance for your research needs. Please feel free to check out our 10 Tips, ELISA Technology overview, %CV in ELISA, and/or contact our Technical Support Team for further assistance. Highly sensitive ELISA, measuring DHEA in culture supernatants, plasma, serum, saliva, and urine from any species.